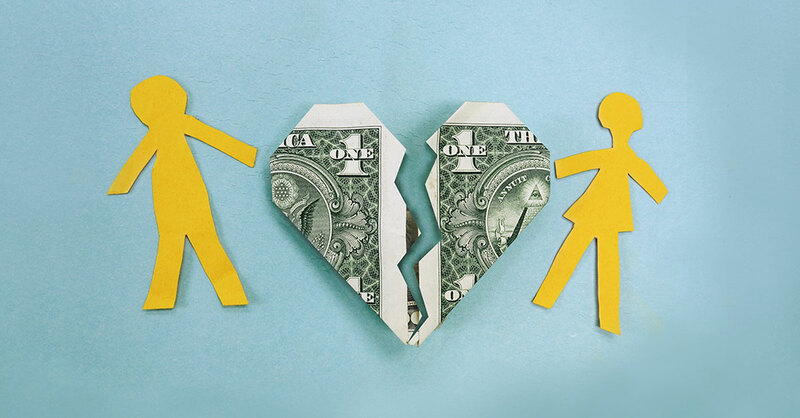 If arguments over money leave you and your partner steaming and sulking, you’re not alone—these financial tensions are one of the major sources of stress for couples, married or not. Among married couples, although they ­argue most often over children and chores, fights over money are more intense, last longer and are more likely to remain unresolved than fights about other topics, according to researchers at University of Wisconsin. That’s no way to have a love affair, is it? For solutions, we turned to psychotherapist Olivia Mellan, an expert on money and relationships. Here is her explanation for why we really fight over finances—and her practical three-step plan to help any couple transcend these battles. Our relationship with money is deeply emotional. Money both symbolizes and embodies freedom, security and control over our lives…and it can be strongly tied to self-worth and our judgments of others. We view money based on a lifetime of experience, including watching our parents handle—or mishandle—their finances when we were children. When we find our romantic partners, it’s really true that opposites attract. Spenders, who believe that spending is a way to show love, often wind up with savers who feel just as deeply that saving is the only way to be secure. Even if you didn’t start out as opposites, chances are you’ll eventually end up that way. Example: Two spenders marry, and one of them eventually becomes a “­super-spender” while the other becomes a saver (and planner). After all, someone has to take on that role! Perception matters, too. Researchers from Brigham Young University and Kansas State University discovered that husbands who merely thought that their wives were too loose with money—whether or not their wives really were—had more money fights with their wives than husbands who didn’t think so. It was true across all levels of income and all types of spending habits. Acknowledge your secret envious feelings. If you are a spender, you may marvel at a saver’s skills at delaying ­gratification—but fear that if you admit this, your partner may rein in your spending even more tightly. If you are a saver, you may be impressed with a spender’s abilities to enjoy life—but worry that admitting this will encourage your partner to spend wildly. Admitting your admiration for your partner’s ways creates a sense of safety and goodwill—tremendous goodwill—and helps you to start thinking about your money issues in a different way. Play the opposite role. Doing what doesn’t come naturally increases empathy and understanding. Don’t ­worry—you aren’t committing to doing it forever! Examples: If you’re a saver, spend $25 or so each week on something nice but frivolous for yourself or your partner. If you’re a spender, start squirreling away $25 a week or so in an envelope, earmarked for savings. Do this “opposite” behavior for a few weeks, and write down how it feels. After a few weeks, you can stop—but be sure to treat yourself with a relatively small reward that feels more natural—a small savings for the saver…a small splurge for the spender. It’s easy to fly off the handle if, say, you are a saver and you see some big new Amazon charges on your shared credit card…or you are a spender and see “vacation” money suddenly put into savings. Here’s a better way: Schedule a time—when neither of you is particularly stressed—for the “structured communication” exercise described below. I’ve adapted it for money issues from the work of psychologist Harville Hendrix, PhD, author of Getting the Love You Want. Mirror. Speak your piece about your partner’s money move that upset or worried you. Pause every sentence or two so that your partner can repeat exactly what you just said and ask you, “Is there more?” If there is, continue. If not, move on to validating. Validate. Almost certainly you understand what your partner said, but now try to affirm it in a compassionate way. Example: “It makes sense that you spent that money on Amazon. You felt flush with money because we already put an extra $250 into the emergency account.” When you’re done, ask, “Is there anything else you’d like to see validated?” If not, it is time to empathize. Empathize. If you have been sincere, you’ve been empathetic all along—but now be explicit. Name the emotion you think your partner is feeling without giving the cause. Use just one or two words such as “hurt”…“angry”…“hopeful”…“felt understood.” Your partner can correct you if you’re mistaken and tell you how he/she really feels. Now switch roles—it’s your partner’s turn to mirror, validate and empathize. Looking at your money together facilitates financial teamwork. Start holding meetings once a month, and always precede them with the structured communications exercise described above. You can go over your past, present and future spending, saving and investing—and your goals. After you get into the groove, you might have the get-­togethers more often and for shorter amounts of time. But always use the structure so that you start from a place of intimacy instead of hostility. If you are doing all these things and still cannot get on the same page ­financially, you may want to consult a financial therapist. Find one at Financial TherapyAssociation.org.